30% to 35% humidity level. The most popular Vanilla amongst my customers. From 1.6% to 2.4% vanillin level. Fully matured, 30% to 38% humidity level. Overlooked because the beans are cracked but it's a great sign of quality. From 1.6% to 2.1% vanillin level. Its quality is the ultimate compromise between the EU-US brown vanilla and the Gourmet Vanilla. Its name is a reference to its aspect (both colour and features). From 1.2% to 2.2% vanillin level. One of my favorite, quality-wise, even though it's more matured. Its aromatic range is more intense than a Black Gourmet Vanilla and less creamy. 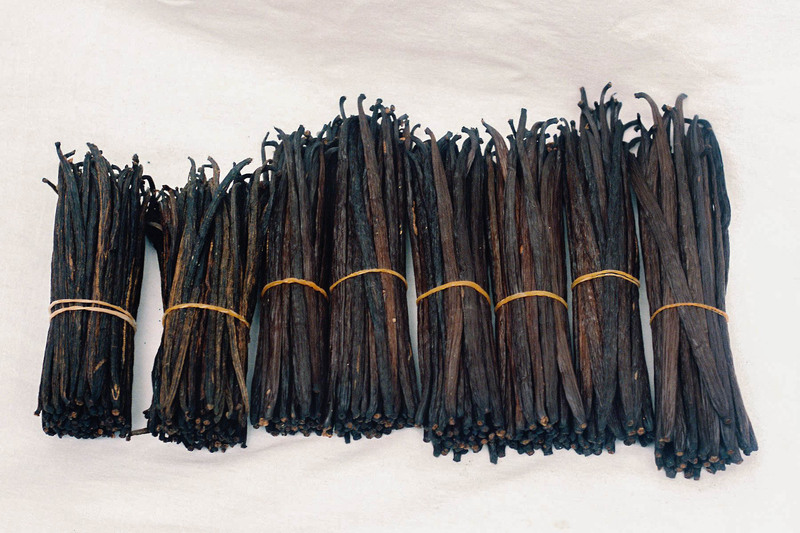 US type red Vanilla, under 20% level of humidity, non-cracked or cracked. From 1.2% to 2.2% vanillin level. Very popular in the industry of aromas, ice cream and flavouring in the US. When "frosting" happens, it means that the level of vanillin in your bean is so high, it starts oozing, creating small droplets that then transform in flakes that end up giving your bean this "frosted" aspect. It’s a sign of great quality. The longer the bean, the higher the vanillin level. "Frosting" can appear if the quality of the bean is high enough. You'll find the origin, size, main flavours and aromatic range of each of my products on their individual page. Each page present the history of the product, my relationship with it alongside ideas of recipes, storing advice, etc. You'll see all the work and time I put in searching for the best varieties and best quality in its full extent.